You start out for the day with a fully charged iPhone, and before sundown, you’re desperately looking for a charger — that too, on a fairly moderate usage. And, if this happens to you quite often, you might be wondering whether your iPhone battery has already started to age. But how do you know for sure? If your iPhone battery performance is not meeting your expectations, it might be due to poor battery health or a software bug. Faulty or defective batteries are often replaced by Apple, for free, within the device’s warranty period. Software bugs, on the other hand, may be fixed with a software update, or in the worst case, a full device restore should fix it. Of course, you could ask Apple to help you diagnose the issue and give you the right solution. But sometimes, they might suggest you leave your device at the Apple Store for a few days, which might not be a convenient option for you. Instead, there are a few things you could check yourself, in order to verify whether you need to really change your iPhone battery, or rather wait for a software fix. The first step is to diagnose your iPhone’s battery health, with parameters like charging capacity, wear level, battery charge cycles, etc. For this, we have an iOS app to give you a basic idea of the battery, and a Mac app, which gives in-depth battery details, and a few more important statistics. 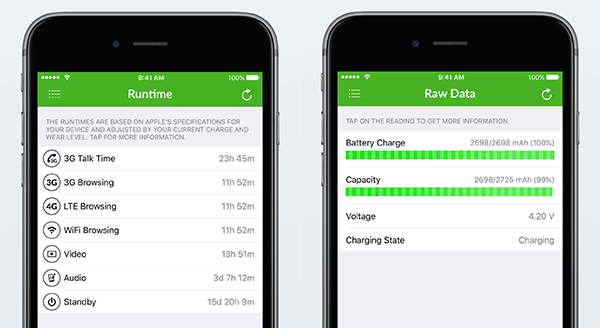 Battery Life is a great iOS app that gives you information about battery runtime, charging capacity and the wear level of your device’s battery. It gives you an overview of how long the battery is going to last, based on the current charge, and different types of usage. Two of the key parameters that indicate the battery health are the capacity and wear level, which collectively show how efficient the battery is at retaining charge. Every battery has a measure of its power over unit time, usually denoted by milliampere hour (mAh) which is known as its capacity. Over time, the maximum capacity of the battery “wears away” through several charge and discharge cycles. More the wear level of your battery, the less efficient it is, and the faster it loses its maximum capacity. 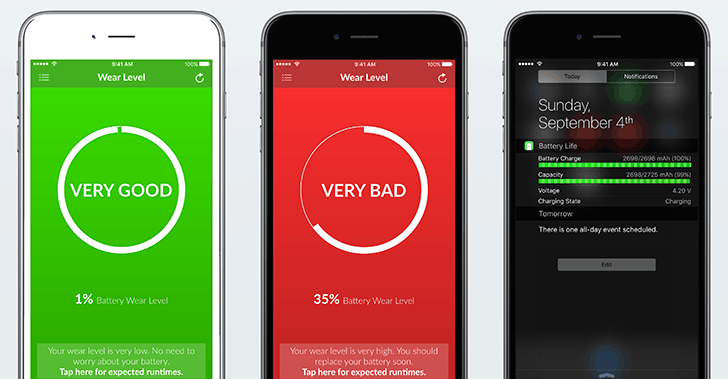 Battery Life can indicate the wear level of your iPhone’s battery. If the wear level is green, it mostly indicates a healthy battery. But you’d also want to track the wearing history, in order to ensure that it’s not wearing unusually fast. Battery life is available for free on the App Store. Battery Life will tell you the current state of your iPhone battery, along with its wearing history, since the installation of the app. If you want to get further details, such as age, number of cycles consumed, etc., a Mac app named coconutBattery will give you that. Batteries have a limited number of charge cycles, beyond which, its efficiency is reduced drastically. A charge cycle may be consumed in one full charge-discharge session, or may be spanned across several charging intervals. Apple has a few tips that will help you to prolong your charge cycles, and thus reduce the number of cycles that you exhaust. 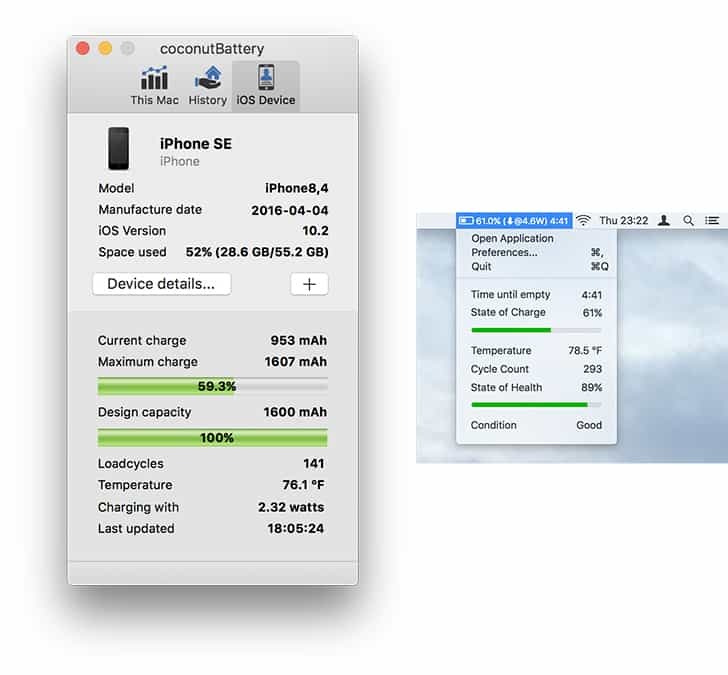 Once you have installed coconutBattery on your Mac, it will provide in-depth details about your Mac battery – current charge level, charge capacity, number of used battery cycles, battery temperature, power input, etc. Connect your iPhone or iPad to your Mac via USB (ensure that it’s unlocked), and you can see similar information about that device as well. Further, clicking on the Device Details button provides device-specific details, such as model number, manufacturing date, age, serial number, etc. Note: There are also some desktop based paid software suites for iOS devices (such as iBackupBot), which include iPhone battery monitoring as one of their utilities. Unless you’re already using it for other purposes, investing in a paid software for just the battery monitoring tool, is not recommended, as both the free solutions mentioned above, provide a good insight on your device’s battery health. Battery Life and coconutBattery will help you to detect a faulty battery, in which case, you should get it replaced. But, if both the apps suggest that you have a healthy battery, next you need to look for possible software issues. Search the Internet for any known reports of battery issues for your version of iOS (especially if you have recently updated the software). If you do find an issue, Apple will likely fix it in a future update. However, if there are no significant reports of battery life issues, associated with that specific iOS version, the issue might be device-specific. In such cases, performing a full restore might fix it. After going through the above steps, if there is no indication of a faulty battery or software, yet you still feel that your battery is draining too fast, a battery benchmark test should be sufficient to confirm (or disprove) your suspicions. Run a GeekBench battery test on your iOS device. If the results are in line with other results (available in GeekBench Browser) recorded for the same device & model, it indicates that there’s indeed no software or hardware issue. In such a case, factors like external environment, or heavy usage, might be responsible for a fast-draining battery. If, however, the results do not align (and the previous tests suggest healthy battery and no software issues), it might indicate a serious issue, and you should consult with Apple regarding this. The above steps should help you to find the root cause of iPhone battery issues, and to take appropriate measures to fix them. Moreover, if you’re going to use a refurbished or second-hand iOS device, the battery monitoring apps mentioned above will help you evaluate the battery condition. Unfortunately, we couldn’t find a good coconutBattery alternative for Windows users. So, if you come across a suitable iPhone battery monitoring app for Windows, let us know in the comments below.